Lord God, I boldly approach your throne of grace, covered in the shed blood of your Son. In Jesus’ mighty name, I ask you to cut any, ungodly soul ties between myself and anyone else. 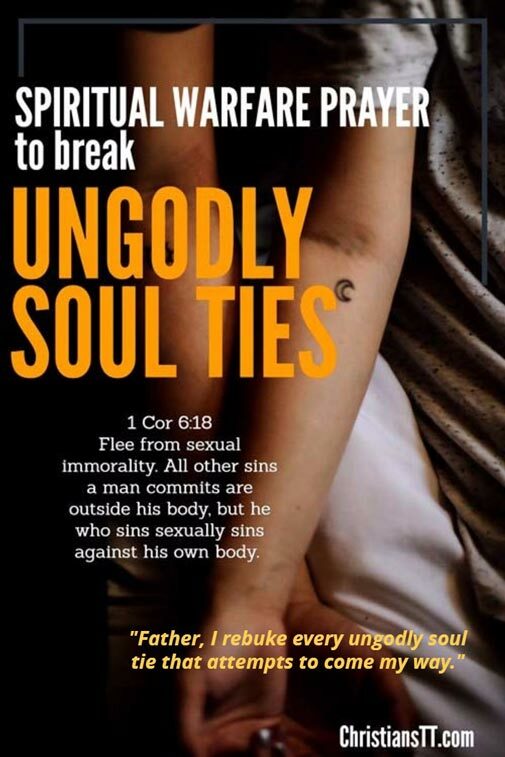 Cut all ungodly soul ties created by any relationship, sexual or otherwise, known or unknown, remembered or forgotten. Dear Jesus, You have already paid the price with Your own blood for me to be totally free. – 1 Cor 6:16-18 – Do you not know that he who unites himself with a prostitute is one with her in body? For it is said, “The two will become one flesh”. But he who unites himself with the Lord is one with him in spirit. Flee from sexual immorality. All other sins a man commits are outside his body, but he who sins sexually sins against his own body. 2 Cor 6:17 Wherefore come out from among them, and be ye separate, saith the Lord, and touch not the unclean thing; and I will receive you. Father, please guide my footsteps to take the right path in this journey called life. Let every step I take lead me a step closer to You. Walk beside me, Lord and, as You never leave nor forsake me, help me not to go astray. Father, as life may sometimes take me to places I may not want to be, I meet new individuals and new souls, and every event that occurs happens for a reason. Maybe You placed me there to learn from mistakes, to change my life or even to be a blessing to another. But wherever You lead me, I will follow. For I believe that you make all things work together for my good. 2 Cor 6:15 And what concord has Christ with Belial? Or what part has he that believes with an infidel? Father, as I encounter new individuals daily, my soul may become entwined with another, causing me to idolize that individual and to lose sight of Your great plan and purpose for my life. I may even lose who I really I am and who You created me to be. Father, I rebuke every ungodly soul tie that attempts to come my way. As I completely commit and fully trust my life to You, I ask that You grant me discernment to recognize these ties that are not of You. Father, break every chain that joins these ungodly soul ties to me, that have been formed out of past relationships. 2 Corinthians 6:16 And what agreement has the temple of God with idols? For you are the temple of the living God. As God has said, I will dwell in them, and walk in them; and I will be their God, and they shall be my people. 2 Corinthians 6:14 – Be not unequally yoked with unbelievers: for what fellowship have righteousness and iniquity? Or what communion has light with darkness? In Jesus’ mighty name, I break the power of any commitments, contracts, agreements, dedications and vows made over me and my family.